Always intrigued by Bach performed on the piano but entirely innocent as to the qualities of Simone Dinnerstein’s playing, I was put on cheese alert by somewhat drippy illustrations from the 1980s in the booklet which presumably serve as mute illustration of burgeoning talent at early age. This is another one of those annoying presentations which provides a personal comment from the soloist and no further information on the actual music. I don’t blame the pianist for this and saving on real booklet notes no doubt cuts costs in an age when download purchases are as likely as shifting actual discs, but with this approach we run the risk of turning such recordings into ephemera. Of Dinnerstein’s other work a further searches revealed Jens F Laurson’s colourful review of the Berlin Concert disc from Telarc, a label which has also released her Goldberg Variations. Live concerts have been given mixed receptions here and here. Sony Classical already has two solo albums from Dinnerstein, Bach, Strange Beauty and Something Almost Being Said (see review). To sum up in advance of hearing a note, it would seem that Bach purists are unlikely to be happy with Simone Dinnerstein’s interpretations, but then I would ask, what is a Bach purist doing listening to Bach played on a Steinway in the first place? Wondering if Simone Dinnerstein might be Sony’s answer to Virgin Classics’ David Fray, I do in fact find myself pleasantly surprised by the quality of her playing. Yes, this is a romantic approach, with a limpid, legato touch in many of the Inventions. There is a dynamic rise and fall which emphasises the shape of phrases, and there is a vocal clarity to the contrapuntal strands which keeps us soundly on message for the most part. Dinnerstein has a tendency to give little expressive delays here and there, in particular in advance of ornaments, and this can lead to some rhythmic strangeness, such as in the extra half a beat which sometimes crops up to distort the Invention No. 10. In the end, most of these performances are very good indeed on their own, but only your individual taste will dictate if you respond to Dinnerstein’s approach. There are plenty of players to admire when it comes to this repertoire. At the drier end of the spectrum we have the incomparable Glenn Gould, who as ever is a frequent seeker of extremes when it comes to tempi, but who explores rich veins of expression and excitement despite the flaws in this recording. Andrea Bacchetti (see review) has an honest directness and is closer to the Gould camp, though with a greater sense of playfulness and less uncompromising touch when it comes to a feel for legato. Compare the magic of his Sinfonia No. 5 to the over-ornamented version we have from Dinnerstein. András Schiff’s 1983 Decca recording has plenty of romanticism and has many excellent qualities, though I’m not always keen on his delayed right hand in some of the slower pieces. Till Fellner (see review) remains a firm favourite for the sheer poetry in his playing, transforming these often simple keyboard pieces into something desirable and unforgettable. I have a declared affection for Angela Hewitt’s Hyperion recordings of Bach, and her Inventions and Sinfonias (see review of the single disc release here, and the big Bach box here) are full of life and variety. Hewitt doesn’t linger much with these pieces, though gives full expressive attention to masterpieces such as the Sinfonia No. 9. Hewitt’s recording is a bit on the dry side, but this lends clarity to the changes in colour she is able to give to the different strands of counterpoint. Dinnerstein doesn’t do this as much, using dynamics and individual atmosphere to point out micro and macro contrasts. 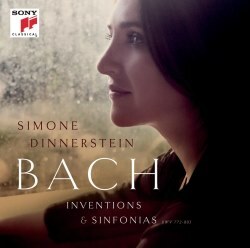 To sum up, I like Simone Dinnerstein’s Inventions and Sinfonias quite a lot, but they don’t hold my attention for a whole CD. I can see myself reaching for this if seeking Bach for relaxation, and like a nice perfume it already holds some pleasant associations, but if I want to be energised and inspired I think there are too many other places with a wider variety of approach.